Chandigarh was conceived as the Capital of Punjab in lieu of its lost Capital of Lahore after the partition of the country in 1947. Le Corbusier, Swiss born French Architect is the planner of the City conceived the Master Plan of Chandigarh as analogous to a human body with a clearly defined Head (Capital Complex), Heart (city Centre), Lungs (Leisure Valley and Gardens), the Intellect (Cultural and Educational Institutions), the Circulatory System (7 Vs) and the Viscera (Industrial Area). The conception of the City has been formulated on the basis of four major functions: Living, Working, Care of the Body and Spirit and Circulation. The residential areas constitute the living part whereas the Capitol Complex, City Centre, University and the Industrial Area constitute the working part. The Leisure Valley, Gardens Sector Greens and Open Courtyards etc. are for the care of body and spirit. The circulation system comprises 7 different types of roads known as 7 Vs. Later on a pathway for cyclists called V8 was added to this Circulatory System. Chandigarh is situated at the foothills of Shivalik Hills, known for its scenic surroundings and modern architecture; the city offers excellent avenues for outings and enjoyment. Quiet and peaceful, the city beautiful is engulfed in green environs. A clean city with open and wide roads, abundance of parks, exhilarating fresh air and so many enticing tourist places to see. All roads running north south are planted with canopy – forming trees, to minimize the low rays of the sun. Thus, walking and driving has become much easier. Roads running east west have these “Vista” forming trees like the Kachnar and the Kusum. The road dividers have flowering bougainvillea, while the roundabouts are beautifully landscaped with evergreen shrubs and sculptures, The silver oaks on the road leading to the cultural complex, and the eucalyptus clusters in front of Tagore Theatre are distinctive. Within the sectors, the shopping streets (V4s) have flowering trees of the same species. At present the ratio between overseas and native trees is about 60:40. Chandigarh was perhaps the first city in India where there was legislation for the protection of trees. Tree Preservation Order was issued in 1956 under which no tree can be felled without the permission of the Finance Secretary. Chandigarh has 3245 hectares under forest and most of it is hilly. The forest areas are mostly around Sukhna Lake, Sukhna Choe and Patiali Ki Rao. There are two reserve forests in Chandigarh – Kansal and Nepli, both the places have forest Rest Houses situated amidst green and flowery lawns. Air: Chandigarh is well connected through different parts of the country by Indian Airlines. Rail: Chandigarh Railway Station is about 8 km from the City Centre in Sector 17. Road: The Union Territory of Chandigarh is well served by an excellent network of roads. The National Highway 21(Ambala – Shimla) and 22 (Chandigarh – Manali) are the chief road arteries linking Chandigarh with the rest of the country. The city is within motorable distances from a number of popular towns and pilgrimage centers. Buses of seven State Road Transport Corporations connect Chandigarh with many cities and towns of neighbouring states. Buses may be air-conditioned, deluxe, semi deluxe or ordinary. The Inter-State Bus Terminus is located in Sector 17 and ISBT, Sector – 43. The important cities that are connected with buses are Delhi, Dehradun, Shimla, Manali, Jammu and major towns of Punjab and Haryana. Capitol Complex: Capitol Complex is the most spectacular work of modern architecture. Though all of Chandigarh carries Le-Corbusier’s stamp, Capitol Complex, presently the administrative hub of two states, contains the best of his talent. 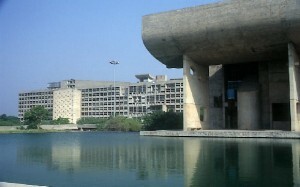 Le-corbusier himself has designed all the buildings in the Capitol Complex – The High Court, Legislative Assembly, Secretariat, Open – hand Monument, Geometric Hill and Tower of Shadows. These magnificent edifices stand as massive concrete sculpture, representing the monumental character and authority that the complex represents. 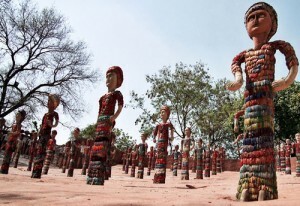 Rock Garden: The world famous fantasy, called the rock Garden has become almost a heritage site. A trip to the Rock garden reveals how urban and industrial waste can be fruitfully recycled and used in creative pursuits. This tourist spot must be on the itinerary of every visitor. 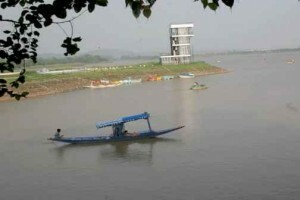 Sukhna Lake: The manmade picturesque Sukhna Lake in the foothills of Shivalik range is an idyllic place for quiet communion with nature and for offering water sports activities such as boating, yachting, water skiing etc. Sukhna is an inseparable part of the City. Serious ‘walkers’ pursue an exercise regime, families enjoy an evening stroll, and painters and nature lovers mingle with children on roller skates to partake of this extraordinary amenity. Photographers and painters love to capture the scenic beauty of the setting sun, or the heavily clouded monsoon sky, or the early morning mist in winter set amidst the tranquility of the lake, even anglers do not leave un-rewarded. Leisure Valley: A continuum of various theme gardens to lake “care of the body and spirit” of the City. Le Corbusier retained the eroded valley of a seasonal rivulet on the original site of the City and sculptured it into a linear park now over 8 km long. It starts from Sector 1 in the north and leaves Chandigarh at its southern most edge in Sector 53. Rajendra Park: The Leisure Valley starts from the Rajendra Park are situated in the sector 1. The park is a vast stretch of land of about 400 acres abutting the Secretariat building on its eastern side. Le Corbusier himself designed the landscape scheme of this park. Trees with round canopies and evergreen foliage have been planted here. It was started in 1954 and is used for long walks, learning to drive and horse riding. Smriti Upavan: This space has been set aside to allow people to plant trees in the memory of the departed in the sector 1. This is a garden where every tree commemorates someone who is no more. It was formally inaugurated on 14-11-1998 by planting a banyan tree in the memory of the first Prime Minister of India, Pandit Jawaharlal Nehru. It is situated between Rock Garden and Sukhan Lake. People can plant trees in the memory of their near and dear ones. Bougainvillea Garden: This garden spreads over an area of 20 acres in sector 3. The natural choe running through the valley starts from here. The garden is devoted to hundreds of varieties of bougainvillea. A few flowering trees have also been planted to give colourful effect during the intervening period of bougainvillea flowering time. Botanical Garden: There are two Botanical Gardens in the City – one between Rock Garden and Lake and the other in Punjab University in sector 14. The one situated in the University is more developed. One corner of this is devoted to cacti and succulent plants. In another corner of the garden are grown evergreen and exotic plants. Rose Garden: The largest rose Garden in Asia is situated in the sector 16. It is spread over an area of 27 acres and has more than 17000 plants representing some 1600 varieties of roses. Along with the roses, emphasis was also given to the trees of medicinal value and some unique species of trees to enhance the beauty of the garden. This garden is the venue of the annual Festival of Gardens, an event listed on the national calendar of fairs and festivals and is held in February / March of every year. Shanti Kunj: Shanti Kunj is situated between Rose Garden and Cricket Stadium in Sector 16. This is a completely noise-free area with natural undulations. The natural stream running through this garden divides the park into five areas. The five parts of the garden depict different kinds of trees such as medicinal plants, vertical shaped trees, flowering trees, trees for shade and environmentally suitable trees. Children Traffic Park: The area of Leisure Valley in Sector 23 has been developed into a Children’s Traffic Park. The roads have been constructed and traffic lights have been installed in miniature form. This park is meant for children who are learning to cycle and designed to teach them the rules of road safety. Terraced Garden: A small valley running through the length of the sector 33 has been developed into a Terraced Garden. Its main attraction is an illuminated musical fountain. The garden is the venue for the annual Chrysanthemum Show. It is spread over 10 acres and was opened in 1979. 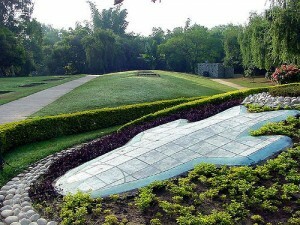 Topiary Park: It was opened to the public in 1987 situated in sector 35. Many animal shapes created out of creepers and bushes attract children to this park. A large variety of ornamental plants add to the park’s charm. Hibiscus Garden: It covers an area of 8 acres and about 40 different varieties of Hibiscus shrubs have been planted to provide colour throughout the year in the sector 36. Garden of Fragrance: This garden is situated to the south of the Hibiscus Garden in the sector 36. It is very popular for different varieties of aromatic and fragrant plants. The flower plants like Raat Ki Rani, Motia, varieties of Jasmine, Damask Rose, Mehndi, Champa, Haar Shingar and many others cast a pervading aroma in this part of the Leisure Valley. Sector Greens: The Sector Green is an open space that runs from northeast end throughout the entire length of each sector. 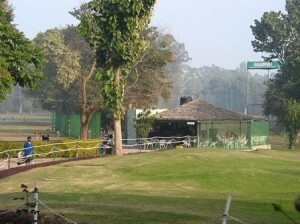 In some of the sectors these greens have been developed into theme gardens such as the Bulbous Garden in Sector 9, Terraced Garden in sector 33 and the Topiary Park in Sector 35. Within the various sectors of Chandigarh, small parks have been located between clusters of houses to be used by the residents for social and recreational purposes. The children of the area also play in these parks. At least one or two parks in each sub-sector have been specially provided with children’s play equipment. The mango Belt: The mango belt is located along the Purv Marg of the city, separating the Industrial area from the Residential Area. It runs northeast to southwest, starting from the transport area traffic lights to Sector 47, covering about 4 km. On both sides of the road 12 rows of mango trees of different varieties such as dusheri, langra and chausa have been planted. This belt constitutes a complete tree buffer to protect the residential areas from the pollutants emanating from the factories and also from the heavy traffic moving along Purv Marg. About 5000 mango trees have been planted here. This entry was posted in Chandigarh and tagged Botanical Garden, Bougainvillea Garden, Capitol Complex, Children Traffic Park, Garden of Fragrance, Hibiscus Garden, Leisure Valley, Rajendra Park, Rock Garden, Rose Garden, Sector Greens, Shanti Kunj, Smriti Upavan, Sukhna Lake, Terraced Garden, The mango Belt, Topiary Park. Bookmark the permalink.